From Wood-Fired Pizzas To Nutella Tiramisu, This Cafe Has Us Drooling! Cafe Imroze comes with a cosy setup on Infantry Road and offers a menu full of pizzas, pastas, waffles and shakes. Plus on Friday’s they do biryanis for lunch! The cosy cafe is serving up everything from salads to nachos and fries to loaded burgers and pastas. They claim their biggest speciality is their thin crust wood-fired pizzas. With a wood-fired oven in the cafe, their bases and breads are all freshly baked here. 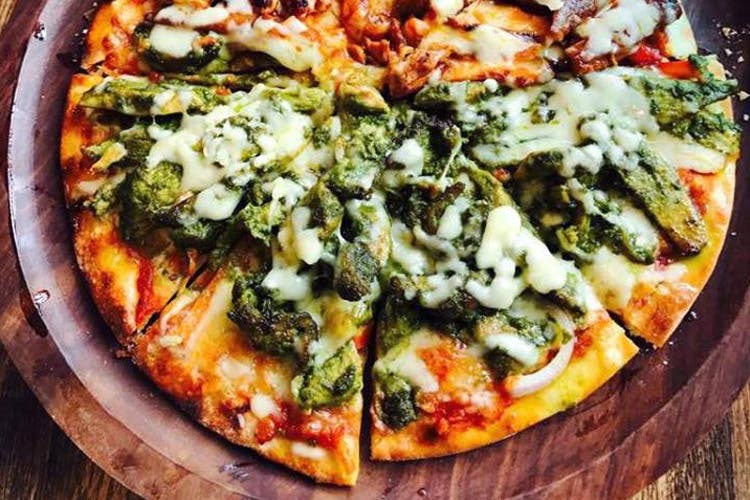 Their most popular pizza is their Veg Pizza that costs an easy INR 99. In fact, all of the stuff here is very reasonably priced. The BBQ Chicken Burger, is a loaded burger served with fries and Coke that costs INR 195 and their starters are priced anywhere between INR 75 to INR 150. From cupcakes and lemon tarts to cake pops and pies, this is your sugar coma’s new address. With a display case full of desserts, keep all those sweet tooth cravings at bay by indulging in some of their decadent desserts. Speaking of decadence, be sure to try out their loaded monster of a chocolate shake, the Batman Shake. Served in a glass jar, the chocolate shake has wafers, sticks of chocolate, ice cream and sweet sauce piled on top of it. This one definitely belongs on your IG feed. Other popular desserts include their Nutella Tiramisu and their Smores Jars. With its big glass windows and a quaint outdoor seating, the cafe looks great. The place is small and cosy, with rustic interiors complete with simple wooden tables and chairs. Although, anytime is a good time to catch a meal here, we recommend going there sometime in the evening as they place looks lovely then. With cute fairy lights and their fancy light fixtures all lit up, pair your meal with the perfect mood lighting here. These guys serve biryani every Friday during lunch hours.